Avery Old Coyote, of the Flathead Reservation in the U.S., was playing a round of Cards Against Humanity with some friends when inspiration struck. During a round, a white card reading "smallpox blanket" was drawn from the deck. He recalled his fellow players looking to him for permission to laugh. Avery Old Coyote, of the Flathead Reservation in the U.S., was playing a round of Cards Against Humanity with some friends when inspiration struck. The game has been dubbed "the party game for horrible people" and it's easy to play. Each round, a player draws a black card with a question or phrase. Then, the other players select their craziest or most hilarious white card to go along with it. The player who gets the best reaction wins that round. 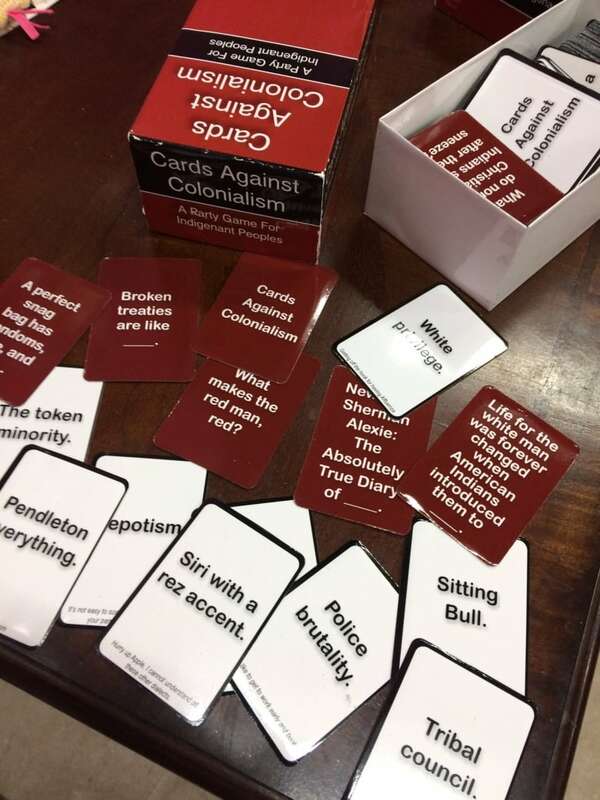 Cards Against Colonialism pokes fun at Indigenous stereotypes and challenges taboos. (Melissa Daniels)During a round, a white card reading "smallpox blanket" was drawn from the deck. He recalled his fellow players looking to him for permission to laugh. "What I think about Cards Against Humanity, is it's really just a game that gives a safe space for white people to laugh at brown people, and those that are less privileged. So, if there are people laughing at smallpox blankets, and trails of tears cards in Cards Against Humanity, then we should be able to laugh at ourselves." So he created a game for Indigenous peoples to do just that. Except, in this case, the cards are red and white. When Cards Against Colonialism was released, Old Coyote said it didn't take long for people to share their feelings on the game. "The reaction was pretty swift. I've gotten some pretty positive feedback from those really close to me," he said. "But then, you know, with social media, and trolls, and all the like, there's been some pretty harsh criticism as well." Old Coyote said it was a card about peyote that stirred up the most controversy, to the point where people have told him to "burn the game". "I know that the ceremony, and the ritual, is never supposed to be… it's not supposed to be laughed at. But, to a person in the right frame of mind, it can be funny. So, I didn't really hold back anything. But, I think in this particular situation, the person felt personally attacked because it was so close to them." He believes it's those kinds of reactions that provide insight into how much the Indigenous community needs a game like Cards Against Colonialism. "Our ability to laugh at ourselves is what I think got us this far. Our ability to adapt, and our ability to survive, is largely credited to that humour." Should high school reading lists be more relevant to today's kids?